The cohort approach, which has gained popularity with graduate level programs in the United States, presented the researchers with the unique opportunity to use a year-long Scholarship of Teaching and Learning (SoTL) approach to study a cohort of 19 in-service teachers and their own perception of their technology integration knowledge, skills, and emerging technology, pedagogy and content knowledge (TPACK), along with the factors that impede effective technology integration. Quantitative and qualitative data were generated through multiple sources during the first phase and through focus groups during the second phase of data collection, six months later. Comparison of pretest and posttest results and typological analysis of qualitative data generated before, during, and after engaging in technology-rich instruction, during the first phase of the study, confirm that coursework that provides direct instruction and hands-on experience with contextual TPACK-focused instruction enhanced K-12 teachers’ perceived ability to integrate technology into their teaching practice. It also helped to identify challenges faced by teachers in their own classrooms. Machado, C. & Laverick, D. (2015). Technology Integration in K-12 Classrooms: The Impact of Graduate Coursework on Teachers’ Knowledge and Practice. 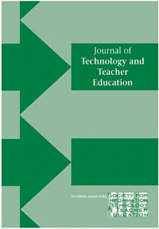 Journal of Technology and Teacher Education, 23 (1), 79-106. Waynesville, NC USA: Society for Information Technology & Teacher Education. Retrieved April 21, 2019 from https://www.learntechlib.org/primary/p/130168/. Cubukcuoglu, B. (2013). Factors enabling the use of technology in subject teaching. International Journal of Education and Development using Information and Communication Technology, 9(3), 50-60. Fullan, M. (2009). The challenge of change: Start school improvement now! (2nd ed.). Thousand oaks, Ca: sage. Harris, J.B., & Hofer, M.J. (2011). Technological pedagogical content knowledge in action: a descriptive study of secondary teachers’ curriculumbased, technology related instructional planning. Journal of Research on Technology in Education, 43(3), 211-220. Mouza, C., & Wong, W. (2009). Studying classroom practice: Case development for professional learning in technology integration. Journal of Technology and Teacher Integration, 17(2), 175-202.